About the festival: From December 14 to 16, the 9th edition of the Calcutta International Guitar Festival, organized by the Indian Federation of Guitar, will take place at the ICCR in Kolkata. In addition to the master classes given by renowned masters, a national guitar competition will be sponsored by the Spanish Embassy and the Cervantes Institute to recognize the work of the best Indian performers of this instrument. About the guitar player: After an initial self-teaching period, Javier Somoza completed his classical music studies in Madrid, his birth city, in the Real Conservatorio Superior de Música with the Professor Jose Luis Rodrigo in 2000. In the same period received classes from Gerardo Arriaga (in several disciplines: Performance Practices, Musicology and Basso Continuo) Ramón Paus (jazz guitar and composition) and Jose Miguel Moreno (Renaissance and Baroque plucked string instruments). Other important maestros for his development as a musician have been Jesús Burguera (pianist and orchestra director) and the master courses with Pavel Steidl, Pablo Marquez and David Russell. He recently finished his Master Degree in Musicology with the guide of Dc. Gerardo Arriaga in the Universidad Complutense of Madrid with a research about Frank Martin's Guitar and Chamber Music. Nowadays, Javier Somoza holds an intense activity as a soloist (playing in important auditoriums like Moscow International House of Music, Auditorio Nacional de Madrid, Daejeon Culture & Arts Center, etc.) with orchestra (Spanish National Orchestra, The Siberian State Symphony Orchestra in Russia, etc.) and taking part of different Chamber Music projects with Daekun Jang (guitar), Manuel Guillén (violin) and Mariví Blasco (soprano). Since 2008, Javier Somoza is Guitar Professor in the Real Conservatorio Superior de Música of Madrid and holds many other teaching activities: master classes, seminaries and conferences that offers in Spain and many other countries in Europe and Asia like: Kunst Universität of Graz (Austria), Sevilla International Guitar Féstival and Competiton (Spain), Academia di Spagna in Roma (Italy), Korea International Guitar Festival & Competition in Seoul Daejeon and International Guitar Competition (South Korea), Curso Silva Monteiro de Porto (Portugal), Leon Tolstoy Festival "Garden of the Geniuses" of Yasnaya Polyana (Russia) an many others. 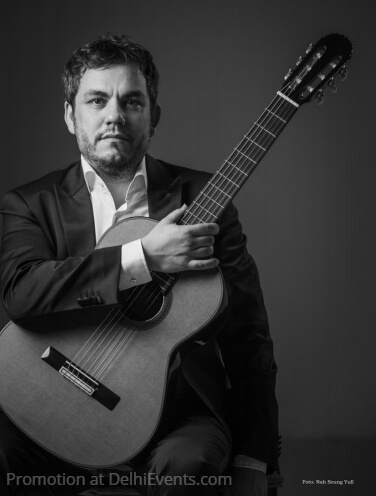 Javier Somoza is Honorary Member of the prestigious “Segovia Guitar Academy” of Pordenone (Italy) and member of the Editorial Council of Roseta, the Spanish Musicological Review, edited by the SEG (Spanish Guitar Society). He has recorded for RNE (Spanish National Radio) and collaborates as a performer with the Spanish National Orchestra.